Matt Hart and I got out for an outstanding loop in the Tetons. 17.5 miles, +5700kft of vert and incredible views the entire way. We started with a march up to Table Mtn, then descended off the southern side of it. A bit of cross-country travel brought us to the Schoolroom Glacier. Then we hoofed it up to Avalanche Pass (off-trail), descended into the upper part of Avalanche canyon and skirted just above Snowdrift Lake (there is no trail in Avalanche Canyon, but it’s pretty easy going). Then a short climb up to a rarely visited saddle which we then dropped off the southern side of and hooked up with the main trail leading back to Sunset Lake. A short connector trail tooks us to the main Alaska Basin trail and then a nice 7.7 mile run back to the trailhead. What a stellar run. How difficult were the off-trail aspects of this hike? 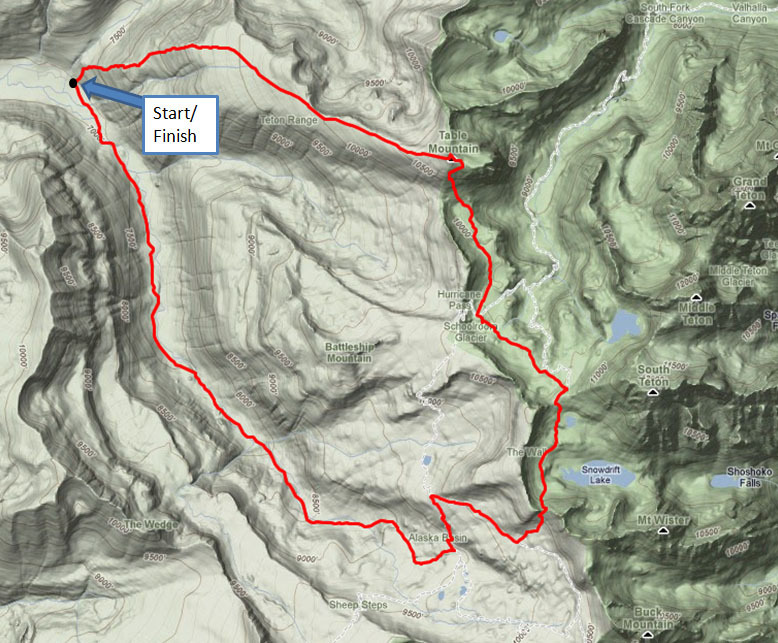 I’m looking at doing the same as a run starting/ending at Sunset Lake and am curious about the off-trail descent from Table Mountain and the unnamed saddle out of Avalanche Canyon. Any and all tips or pointers are appreciated! Great adventures you’re having. Just curious what mapping software you use to document your travels. I’ve been looking at the Nat’l Geographic and Delorme products, any insight? Keep getting after it! You’re getting to know the Teton backcountry well! Although it’s very accessible, few people venture into the backside (west side). I was noticing a lot of blue sky in that photo! So jealous. I don’t think it gets any better than that. Incredible pics of Alaska Basin! Nice job you guys!